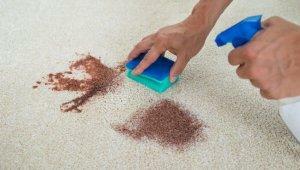 Time & patience are the keys to carpet stain removal. If a spill occurs, immediately try to remove it by blotting with a slightly damp sponge, or a dry, white paper towel. Rinse by misting with cold water and further blot with an absorbent white towel. If this procedure fails to remove the stain, follow the procedures outlined below. In the event of a spill, take time to carefully read the following procedures and follow them thoroughly. Where two procedures are listed (Example A-M), start with the first procedure (A), and then follow with the second procedure (M), if necessary. Continue to repeat the procedure(s) until you no longer see any improvement. If you are not successful with the stain removal, please call us for additional help at 703-914-2811. Apply dry cleaning fluid, use dry towel/cloth. Blot, don’t rub. Repeat dry cleaning fluid application as above. Blot, don’t rub. Finish with weighted pad of towels. Scrape or blot up excess spill. Apply detergent (see Cleaning Solutions”), use damp towel. Blot, don’t rub. Apply water with damp towel. Blot, finish with weighted pad of towels. Scrape up or blot up excess spill. Apply detergent (see “Cleaning Solutions”), use damp towel. Blot, don’t rub. Apply ammonia (see “Cleaning Solutions”), use damp towel. Blot, don’t rub. Apply water with a damp towel. Blot, finish with weighted pad of towels. Apply white vinegar (undiluted), only after stain is removed. Apply nail polish remover (non-oily acetone type) to a white, cotton towel and apply to spill. Do not saturate carpet. Pick up softened material using a clean, white paper towel, push toward center of spot (to avoid spreading material). Repeat above, soften and carefully remove a layer of the material each time. Haste may spread the stain and/or damage the carpet. Apply detergent solution (see “Cleaning Solutions”) to white towel, leave 3-5 minutes. Blot, don’t rub. If stain is removed, finish with a water rinse, then blot, then apply a pad of weighted paper towels. If stain is not removed, continue as follows: Apply hydrogen peroxide solution (see “Cleaning Solutions”), let stand 2-3 hours under a weighted sheet of plastic wrap. Repeat application of hydrogen peroxide and allow to dry until removal is complete. Apply water with damp towel. Blot finish with weighted pad of paper towels. Apply white vinegar (undiluted) only after stain is removed. Scrape off excess material. Cover with white cotton towel or brown paper. Lightly apply warm iron to towel or paper until material is absorbed. Be sure towel is large enough to cover the stained area. Never touch the iron directly onto the carpet, as the fiber may melt! Change towel or rotate same towel to a clean area and repeat until all material is absorbed. Vacuum away as much as possible. Loosen remaining material with a scrub brush or toothbrush. Tap with brush, do not scrub. Vacuum again. Follow with procedure “B”. Rug stains are inescapable. At once or another you will be faced with having to remove a stain from your carpet. Always follow any type of instructions provided by the carpet producer. Carpetings made from all-natural fibers or particular dye kinds could need unique therapy. If you are unsure talk to a cleaning specialist for aid. But also for many usual discolorations if you comply with these carpet stain removal tips as well as you’ll have your discolor lifted in a snap. Blot with a paper towel to remove as much of the stain as you can, after that neutralize with a white vinegar option comprised of 1/4 cup white vinegar in 3/4 mug of water. Soak the place with white vinegar service then blot to remove the excess dampness. A spray bottle works well for using the solution. If you the discolor has still not raised mix 1 tsp of meal detergent such as Delight right into 1 quart of water as well as relate to the location. Blot to work the detergent into the discolor, then blot again to lift the tarnish. Repeat up until the tarnish is gone. Then rinse with water and blot excess water up. Do not use meal soap which contains bleach or lanolin as it will certainly harm your rug. Get rid of as much of the spill as you can by scraping the unwanted up with a dull blade. If you have a damp vacuum it works well for sucking up the excess. If the spot has actually currently dried you will have to fill it with water to ensure that you could raise the excess. First attempt eliminating with water by spraying the area and then blotting with paper towel. If that doesn’t entirely raise it after that use a tiny blend 1/2 tsp recipe soap in 1 quart of water as well as use the mix to the location. Continue blotting to lift the discolor. Proceed using until the stain is completely lifted. After that wash location with water making use of a spray bottle, and also blot to eliminate excess water. If the soap mix did not lift the whole tarnish after that dampen the area with 3% hydrogen peroxide as well as allow mean on 2 hours. Blot and repeat the hydrogen peroxide treatment till carpeting the tarnish is gone. When exposed to light hydrogen peroxide go back to a water state so you don’t need to wash just dab up the excess moisture. Take a piece of brown paper or a terry cloth towel over the area after that gently run a cozy iron over it. The wax will be taken in into the paper or towel. You can eliminate and also residue using alcohol or completely dry cleaning liquid. Eliminate as much of the crayon by blotting with paper towel. Utilize a dull blade to scuff up exactly what you can. After that use rubbing alcohol to a white cloth or cotton sphere as well as blot. You could have to use added if the pastel goes deep right into the heap but make certain the backing does not get wet. First blend a remedy of 1 quart water and also 1/2 teaspoon dish soap. Then use a little amount of cleaning agent solution to the area. Blot to work the cleaning agent into the afflicted area. Proceed using and also blotting until the tarnish is completely gotten rid of. If the soap mix did not raise the whole tarnish then dampen the location with 3% hydrogen peroxide and let mean on 2 hrs. Blot and also repeat the hydrogen peroxide therapy until rug the stain is gone. When exposed to light hydrogen peroxide returns to a water state so you don’t have to wash just swab up the excess moisture.